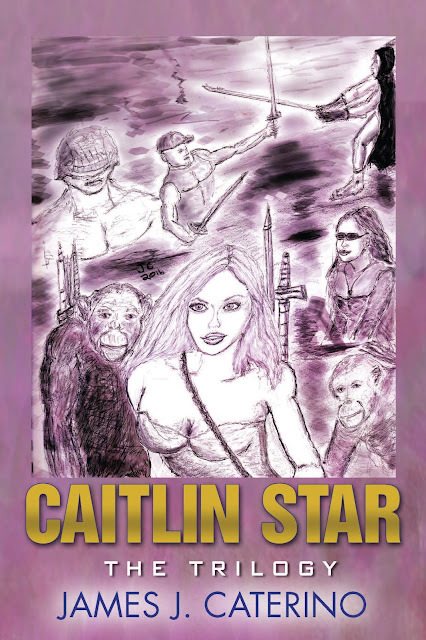 Caitlin Star: The Trilogy, is a collection of the first three action-packed books in the controversial Caitlin Star series, collected in one volume for the first time ever. All three books are newly edited and contain brand new, never before read scenes. Also included is a ten page sketchbook of illustrations by the author, all exclusive to this special-edition collection. Gunner Star takes on Caitlin as his protégé and trains her in the ways of the Bull Mongoni, a mythic species of hominids that lived long ago. An exciting, brave new world opens up for Caitlin as she discovers a new philosophy, and begins to see the world around her from a new perspective. This is the origin story you have been waiting for. Caitlin is called into action by Azrael—a.k.a. the Black Knight—a fellow Bull Mongoni warrior with roots in the Congo. Now she must defeat the White Hand, battle the militia of a ruthless Uganda dictator, and face down a mysterious figure who is manipulating everything behind the scenes for a devious purpose that will threaten every living thing on earth. Caitlin now lives a life of peace and tranquility deep in the rain forests of the Congo among her ape friends, free from the evil and destructive species known as Homo sapiens. All is well until one day a massive cruise ship shows up on the shore carrying hostile invaders commanded by an old arch enemy of Caitlin’s who will stop at nothing to destroy her and the last remaining paradise on earth. Caitlin Star: The Trilogy is an addictive, riveting, hard-edged, YA dystopian action adventure that will blow you away and leave you begging for more.